Food prices skyrocket to new high. That’s what you’ll notice when you are in a supermarket doing your regular food shopping for your family. Before, you’ll get your money’s worth when you buy a particular food or produce. Nowadays, you’ll also need to pay for the other “hidden” expenses such as fees to transport food, gas fees, and a whole lot more. This is mainly because of some contributing factors like increasing oil prices, diminishing food supply, plummeting currency exchange rates, and many others. Now, concerned shoppers are on a mission of finding great deals that would fit their budget and at the same time satisfy their family’s nutritional needs. It is very important to be prepared financially and emotionally before you go straight to the aisles of your favorite supermarket. You don’t want to impulsively buy things you don’t really need and store them in the fridge for ages. It is important to eat a filling snack before heading the grocery store so you won’t feel hungry especially when you see a delicious banana cream pie on the shelf. Another thing is that having a weekly meal plan is a very rewarding habit to have in your home. Every week you can just check your food inventory and start from there. Plan ahead on which dishes your family would like to have and list everything that you would need that you don’t yet have. This way, next time you go shopping you know exactly where to go and what to buy – saving you time and money! Be on the lookout for healthier food groups and definitely you’ll save money in no time. The reason for this is because high-calorie diets don’t really help satisfy your hunger but just your appetite. In this sense, you tend to eat more of this high-calorie foods and thus pushing you to buy more – a not so budget-friendly idea. Meanwhile, buying cheap and at the same time nutritious food absolutely helps satisfy your hunger and also encourages you to start a very healthy lifestyle. Now what are the things that a shopper should do to achieve her mission of feeding her family delicious meals everyday without actually putting a whole in her pocket? This is a pretty tricky issue as it is very subjective depending on the person who is going to eat the food anyway, right? 1. In season food is in! Consider buying in season food produce that can actually give you great deals in terms of not just prices but also freshness. That’s two hits in a row! Be on the lookout for the freshest sales and amazing coupons. Not only you’ll get food products in discounted prices, you’ll also have fun collecting them in the process. In this world you only have yourself to rely on so don’t trust anyone with your food because you’ll never know what goes in it. If you start packing your lunch every day you will have exactly what you want to have and how you want it done. Nothing extra – especially extra calories. From time to time you can let yourself make use of frozen food products such as fish and poultry. This way, you are prolonging the shelf life of your food making them more efficient to be stored especially during unfriendly seasons. Aside from frozen food, you could also try canned items as well as dried ones. 5. Go for the veggies! Instead of buying expensive cuts of fresh meat or poultry, you can try replacing them with eggs or tofu as your protein source. You can have the same amount of protein for a lesser amount of money. Of course you can still have meat once in a while but when you do, prefer the loin or round part to make sure you’re eating lean meat. Give yourself a minute or two to think twice before actually buying loads of new groceries for the week. Ask yourself first what are those for. This way, you can minimize your everyday leftovers and save a lot of money. Be creative in the kitchen and make wonders. If you have leftovers of roasted chiken from last night’s dinner, why don’t you go Mexican for tonight and prepare your family delicious roasted chicken fajitas? It’s that simple! Be wise when buying deceiving food items. Just because a particular brand of butter has a great TV advertisement, it doesn’t mean it that it is the best butter amongst all the other brands of butter there is in the grocery store. Learn how to read food labels and you’ll be amazed on how brands names aren’t really that important after all. Unless it fits your lifestyle, don’t regularly take advantage of items prepackaged into smaller sizes. These products usually cost more as compared when you buy the whole bag, for example. To save you time and money, try preparing and cooking food in large amounts which you can store in the freezer for a certain amount of time. Also, take advantage of bulk purchases by signing up to bulk shopping clubs like Sam’s Club or Costco. You’ll get items that you one in very low prices. Cultivate your very own garden with fresh produce such as fresh eggplants, plump tomatoes, and even herbs and spices. You can start small and eventually add more and more crop in your garden and you’ll be hooked on how rewarding and cost-efficient this new hobby of yours is! 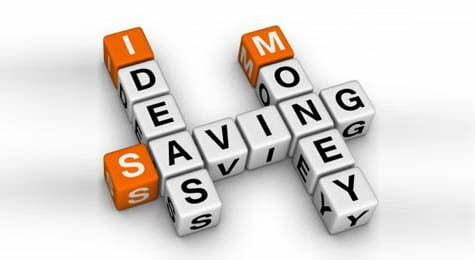 Top 10 money saving ideas is very smart condition approaches and effective solution ideas representive should on your try in your lifestyle ideas.